The best alternative to Sony Vegas Pro for easily editing videos. Sony Vegas Pro is the popular video editing programs in Windows. It provides with decent video editing features including audio editing, video editing, transition, and titles, and more. But wait a minute, Sony Vegas Pro has not the feature you want? Can't import your video source files? Any other problems? Drop it and find a Sony Vegas alternative for Windows in this article. 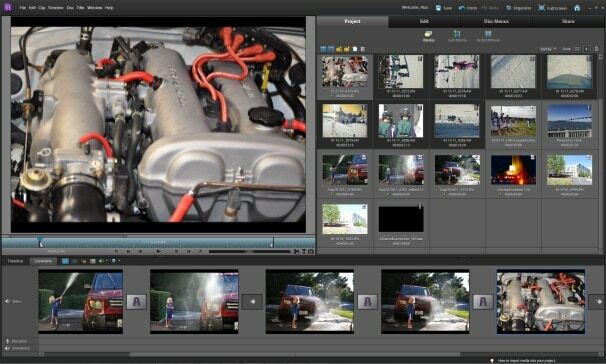 Wondershare Video Editor provides you with all necessary video editing tools you need. It enables you to create Hollywood-like home movies with transitions, titles, effects from any videos, audio and photos. Advanced features like timeline editing, Picture-in-Picture, fast/slow motion, voice change, video/audio recording are made easy to use. The most important thing is that sharing possibilities are endless. You can share instantly with family and friends with easy upload to YouTube, Facebook, etc. Or save videos to play on portable devices like iPhone, iPad, Samsung Galaxy Note, Kindle Fire, etc. or burn DVD for better preserving and sharing. When a product is branded with Adobe, it means high quality, better performance, and consistency with other program by Adobe. Adobe Premiere Elements is a good Sony Vegas alternative for Windows (Mac version also available). Just as what's said on its homepage "the #1 consumer video editing software", Adobe is a popular video editor for home users. For professionals, Adobe Premier Pro is the better Sony Vegas alternative for Windows. It's the higher version of Premiere Element with differences in capturing, timeline editing, multiple sequence editing, DVD menu, surround sound mixing, etc. ZS4 Video Editor is a free Sony Vegas alternative for Windows, Mac and Linux. It is the new incarnation of free Zwei-Stein Video Editor. It comes with simple video editing tools and 150 video effects, but the interface is not so user-friendly. Compared to Wondershare Video Editor and Adobe Premiere, ZS4 Video Editor is not the common video editing software, but free is the most important factor for this Sony Vegas alternative.